I liked the product, however, I wish there was the ability to get a proof so you can see what the end product will look like. I thought the airplane was a little small compared to what the shoe looks like in the sample. We also had a few blanks and the minimum order is a little high. I ordered shoe napkins for my daughter's shoe-themed bridal shower, and they were a nice touch. I really loved the Customer Service offered by Beau-coup. They contacted me because the colors I chose to put on the design were not showing up well. I worked with the customer service rep and we chose another design and color that would fit the theme perfectly. I would give this company an A++ in their customer service! Definitely a company I would like to work with in the future. Just how I ordered, and on time! Ordered for sons 1st birthday party. Only place I could find one that offered a rocket ship as a picture, which matched the theme. I forgot to hit finish purchase original time and a few days later wondered where my confirmation email was. Eventually realized I hadn't actually ordered. Freaked out that they wouldnt make it in time but as soon as I typed in the event date the system recalculated production date and they arrived in plenty of time- w/o having to pay extra for rush shipping. Very happy w/product. These napkins are great!! The printing is excellent. The paper napkin quailty is what I expected. I'm very, very pleased with this purchase. Went looking for something new for a young adult with a small apartment and not the "same o same o" This was a gift with a twist and everyone one was in AHH! No need to hold on to it for the next year! Perfect Way to Personalize your event! Getting these personalized napkins for my daughter's first birthday just added a touch of uniqueness and class to her special day. Guests were raving about how pretty they were in cotton candy pink w/peacock font. Was very pleased with my order and delivery was pretty fast. Ordering anything personalized online is always scary. The napkins were just delivered and the quality is great. They aren't too thin like I was afraid they would be. I'm also happy that I was able to look at the napkins I designed before actually ordering them. The final product was perfect. The only dissapointment I had was that the color was not what I was expecting - I ordered dusty rose and it was more of a pink. Other than that the napkins were perfect! Very nice napkins - color perfect. Napkins were very nice weight - color of imprinting was spot on! I ordered these personalized napkins for a birthday party and they turned out perfectly! They were affordable and added such a nice, personalized touch. They are great quality, arrived quickly and looked even better than I could have imagined!!! Thank you Beau-Coup! This is the second time I have used this company's services. I was satisfied the first time and my satisfaction has continued. I ordered napkins for my mother in law's 92nd. birthday celebration and the color and quality was great. Great hit! Product was made to perfection! Great cocktail napkins that add an extra little touch to the party! Very cute had a small crease in the design but not enough to send back. They were much better than expected. The beverage napkin was good with the exception of the letter centering. If they were centered better it would have been perfect! Used it for my sisters shoe themed bridal shower. Outlined the cake table with the napkins. They were beautifully printed. Loved them! will be perfect not only at the formal luncheon following the service, but also the kids dance party at night. MADE A GREAT GIFT FOR THOSE AT MY RETIREMENT! I used the product for an Easter party I had. The guest towels were perfect for my bathrooms and the cocktail napkins were perfect!! I had "donn's holiday get-together" printed on the front so I can use them for all kinds of holidays. We have a Ladies Golf Group that celebrates every year with a wonderful party. The personalized Cocktail Napkins were smashing and we will keep a supply on hand year round..getting ready to order again. Thanks for the design and color. This was my first time planning a party, and I did this for my mom's 50th party. It was a crowd pleaser and the guests and the guest of honor loved them. I would definitely order this product again. We had these napkins printed with the two baby feet, they matched very well with our theme of "baby feet". The quality was great, the price was great. Beautiful! Would definitely buy again. I have purchased this product to use at my daughters wedding and I can't wait to put them on the tables. They are definitely beautiful. Love the fun and detail of the design, but the icon was a little too big for the size of the napkin. 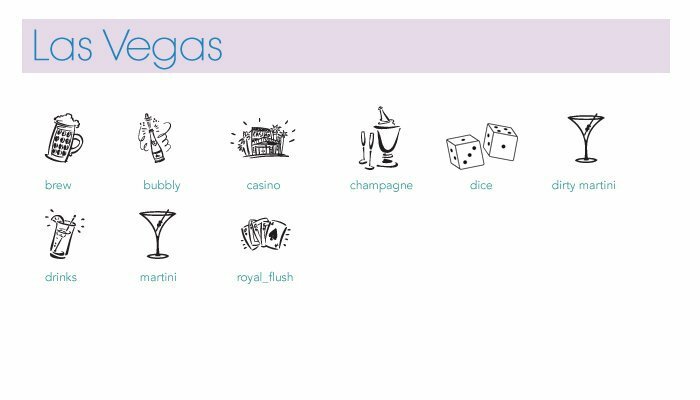 These are really great for bridal showers, and I am sure I will order more for other events. I ORDERED THESE FOR A BABY SHOWER AND THEY ARE, BY FAR, THE MOST EXCELLANT THAT I HVE SEEN. I ordered the napkins for my 40th birthday. The colors were an exact match to what I wanted and I loved the metallic print. The purse that I picked went great great with my "shopping" theme. This was a great addition to the decor for my party. Helped personalize the bridal shower. I loved them! Came out perfect! Colors were dead on! We will be using these napkins for an outdoor rehearsal dinner. The design is very classy and contemporary. We will use these napkins for our son's rehearsl dinner. Our dughter-in-law to be liked these also!! Cheap, Fun Way to Personalize! These were great at our engagement party and made it feel that much more unique, even though we were in a local pub. They were much better made than I expected and the colors turned out great! I liked them so much I ordered them for a cocktail party we'll be having the weekend of our wedding...highly recommended! You might need to be careful on certain color combos but otherwise, these are great! THe kids were surprised by the personalized napkins. They went over very well. I didn't need the minimum, but the napkins were a hit - and we have some extras for memories. Excellent showing for 75th Birthday! As Napkins. The texture and beauty were great! WE ORDERED THE SMALLER SIZE TO USE FOR A BABY GIRL BABY SHOWER. MAKE SURE YOU ORDER ENOUGH TO USE FOR DESSERT, UNDER BEVERAGE GLASSES, AND TO SERVE WITH APPETIZERS. THEY ADDED A FINISHING TOUCH TO THE SHOWER. These were so cute. I was incredibly happy with the colors and look of the napkins I ordered. I would highly recommend these. I ordered these napkins and I love them!! [...] they look great! Great for our parents' anniversary open house! The price for the quanity of the napkins where great. Just wish the site had an online tool to view the item as ordered once you have selected all the text. Some of the angles/measures were unclear when the writing is placed on the napkins. I love it! It fits perfect with my theme wedding. I ordered these custom napkins for my wedding reception, and I think it's a nice touch. Overall, I'm very happy with the product and [...] as well. 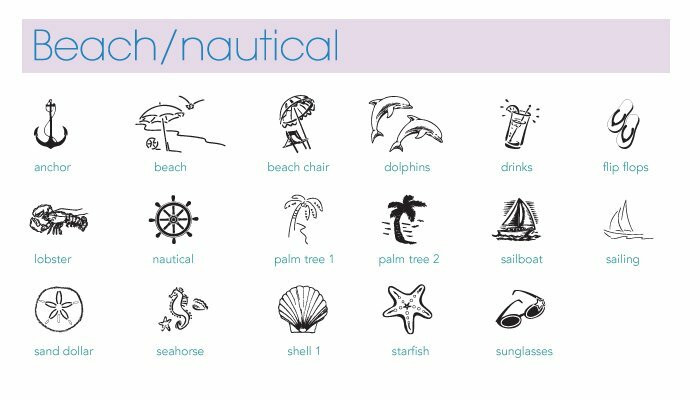 If not asking too much, it would be nicer if I was allowed to pick a combination of different colors and prints for the 100 napkins I ordered. 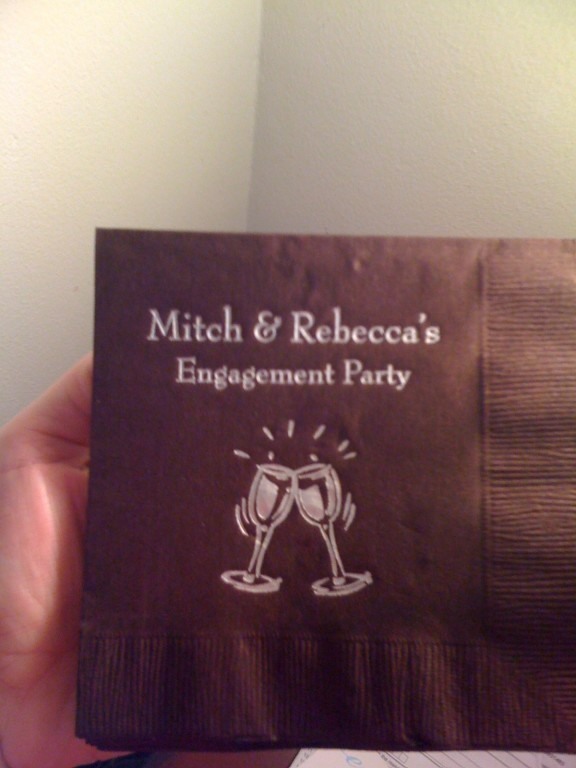 These were great personalized napkins for my bar at my wedding. This products will be used at my wedding and I am very very happy. This was a perfect product that added that something special to a cocktail hour for a birthday party! Each guest wanted to take one home with them as a momento, they were so nice. Left overs were saved for future birthdays and/or special occassions! So glad I found the website! We used these napkins for my sister-in-laws bridal shower. 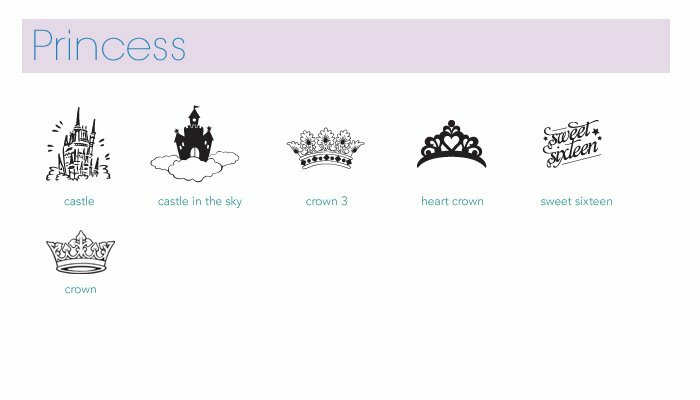 super cute and easy accesory for any occasion! The napkins were exactly like I ordered and looked fantastic! [...] My napkins look great! The colors were perfect. Perfect message to the birthday girl. Everyone loved the napkins. I highly recommend. The tiny pictures made it really hard to see what you're buying, but the napkins turned out nice. They were great however the napkin color was not what I expected. It was a lot lighter. 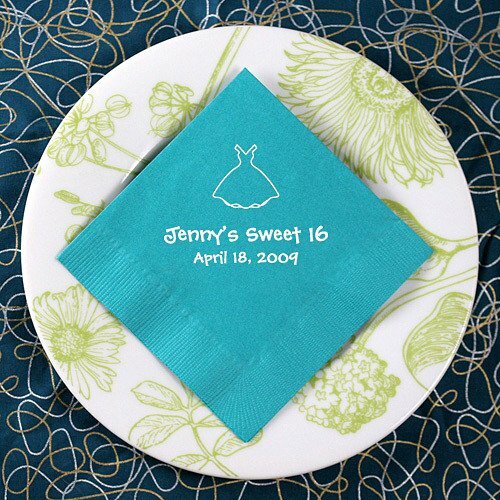 These personalized napkins were a perfect addition to the Baby Shower Favors. They are a good keepsake also. People at the shower thought they were a great idea also for mommy to be to keep for the 1st bday or christning party. Beau-coup did a fantastic job! I personalized napkins for my sister's babyshower. They were a hit! My sister LOVED them and Beau-coup did a fantastic job. The detail and color in the printing was amazing. I didn't expect them to look as good as they did. I will definitely be a returning customer! Personalized Napkins A Big Hit! 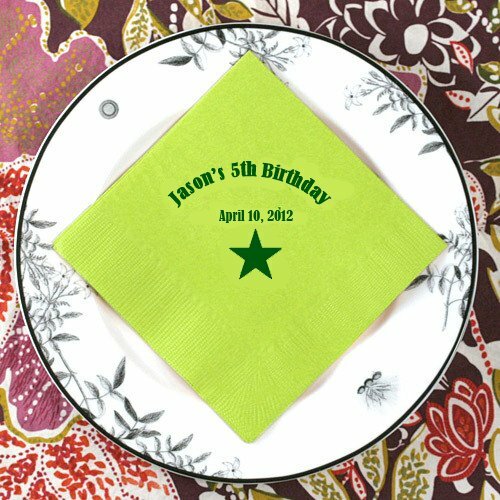 These personalized napkins gave a personal touch to my 50th birthday party which was held at a bar/restaurant. The servers used my napkins when delivering drinks to the guests which really impressed them! It was fun to use them and I saved one for my scrap book. 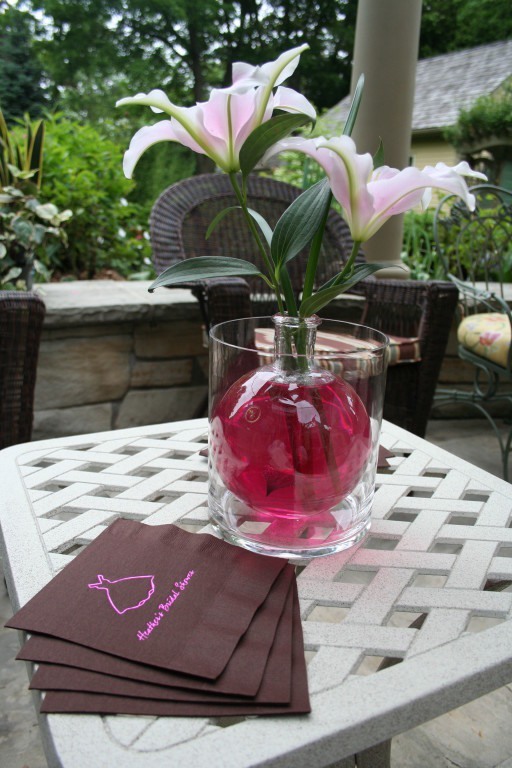 The personalize napkins were a hit and the color matched perfectly. A classy compliment to any party or event. Highly recommended. These napkins were so pretty and matched our color theme of purple with roses. Great Colors to choose from, great printing! The luncheon napkins are perfect! The color we chose down to the style & color font we chose for the napkins will certainly make our future baby shower shine in perfection! Very happy with this item! These personalized napkins was the added touch that was needed as part of the table setting. These napkins were perfect for our cocktail party. The paper was of good quality and the design appropriate for an engagement party. I had to order many more than I needed but I'm sure they'll be used by the guests of honor in the future. These napkins were perfect for my sister-in-law's baby shower. They were so elegant and classy and made the table look so pretty. Who knew a napkin could be so beautiful? Got these as a special something for my sisters Bridal Shower and everyone loved them. Usually people take momentos home, she took some napkins! They were simply beautiful. Although they were costly I think they were worth the added pazzaz! These personalized napkins were a nice touch to the buffet table. We ordered personalized napkins for my daughters high school graduation party and they were almost too pretty to use!!! 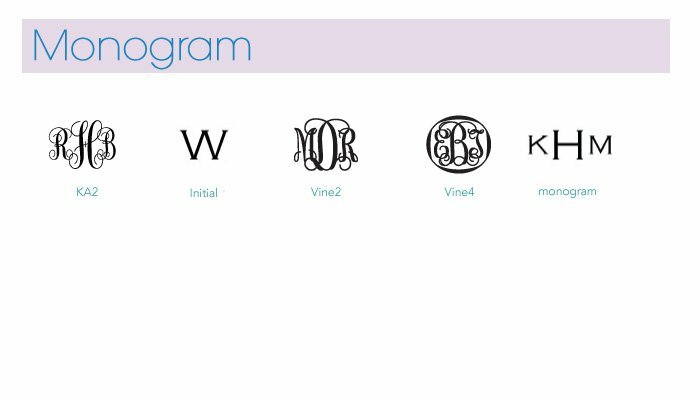 I didn't find your website until almost last minute, but you all worked with me and got everything to me in plenty of time. We bought one set for the bar and one set for the cupcake table. Each set had our names on it with a cute saying and image in our wedding colors. Very unique and fun. purchased personalized napkind for a bridal shower. I used these napkins for a baby shower. The personalization looked great and fit the theme really well. Pretty much what you'd expect for napkins. 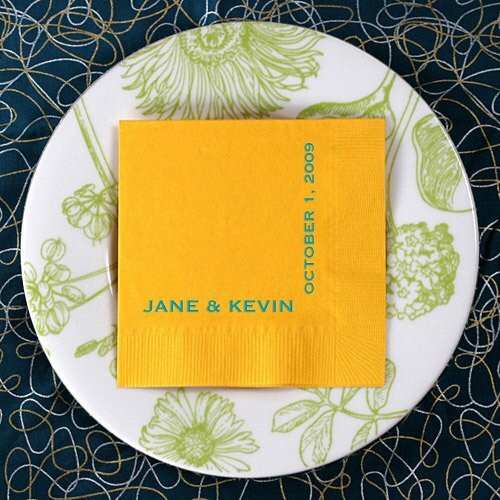 The color of the napkins matched perfectly with our wedding colors, I was very pleased with our choice. I thought these napkins were beautiful and just right for our bridal shower. The bride-to-be and some of the guests were impressed that we had personalized napkins that went so well with our 'sea' theme. I used these at a first birthday party, and they were a big hit. Be careful when entering your preferences on the online site, however. 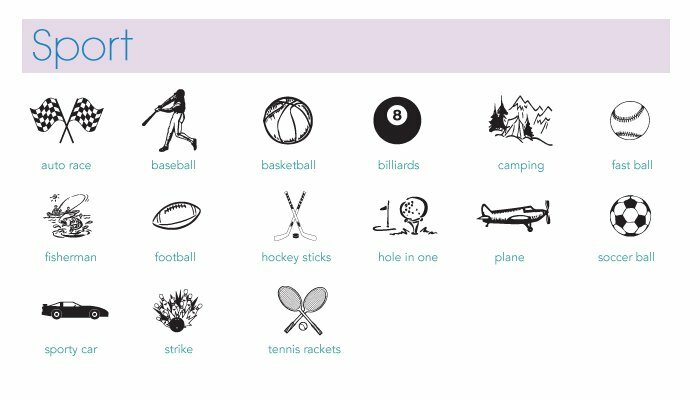 I selected "Birthday party" and thought I was going to get a birthday-related icon, but didn't realize you also have to select an individual icon of many, so I got the default "All Stars" icon which I didn't mean to select. Fabulous addition to the wedding! A great addition to our wedding. The red was perfect for our colors, and the silver writing was great! We would definitely order these again! These turned out just adorable. The color matches great with our shower colors. I ordered these great high quality napkins for my daughter baptism. i choosed the white napkins with matt pink font color. i was afraid that the font color is light on the white napkins, but i send them email and they helped me to choose the colors and its really awesome. great stuff, high quality orders. Guest towels look so elegant and sophisticated in our guest bathroom and power room. We have had so many compliments on these towels! The only issue was the quality of the 'paper', needs to be thicker & softer. A:The blue featured in the example picture is the Caribbean napkin color. 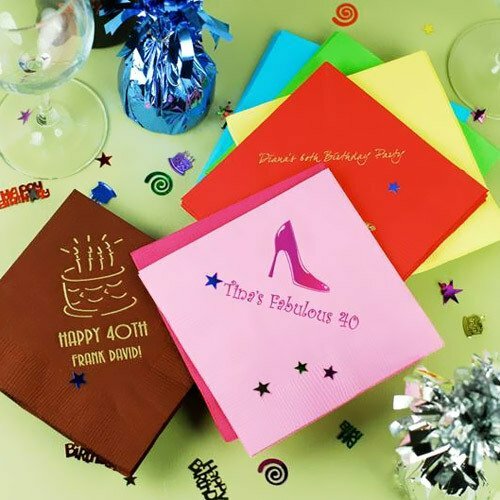 Q:What color is the napkin and print in the 40th birthday napkin in your picture? A:The napkin color is chocolate brown and the foil is brushed gold. Q:What is the font used on the napkin in the picture with the high heel? 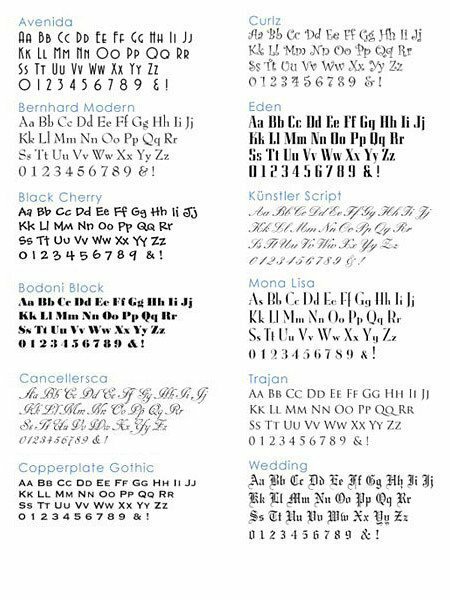 A:The font used for this sample is the "Curlz" design. Napkin sizes may vary up to 0.5" depending on napkin colors. Gaga for galas? 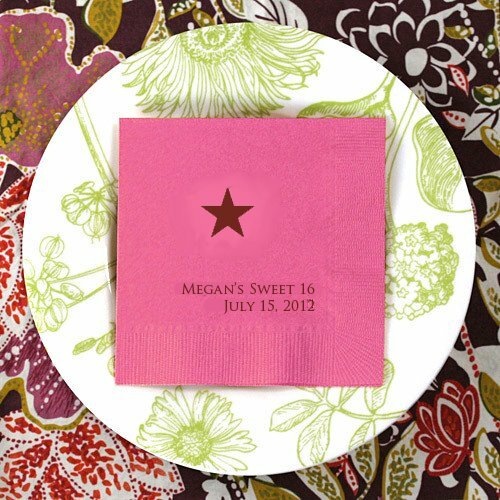 Whatever the theme may be for the birthday party you are throwing, you'll want to have these personalized birthday napkins on hand. Customizable down to the last detail, these birthday party decorations can be personalized in any way you can think up! 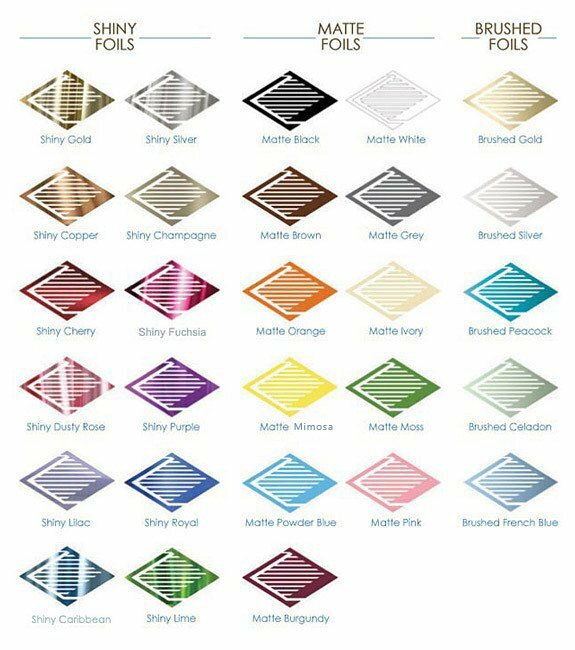 Choose from several napkin colors, icons and a nearly infinite array of imprint colors -your imagination is the limit! 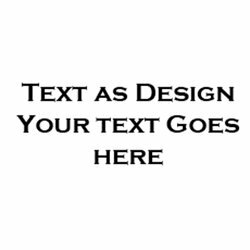 You may even select the design and text placement from eight layout options. 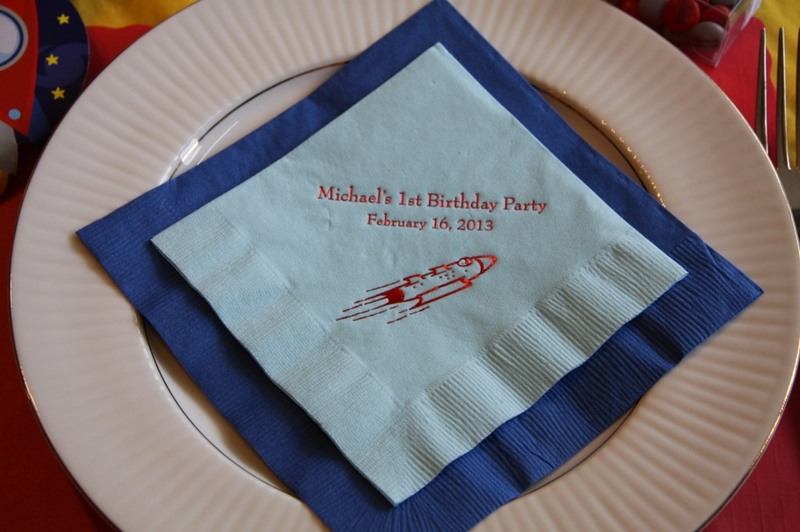 Each practical birthday napkin is made of quality 3-ply paper and is available in beverage, luncheon, dinner and guest towel sizes. 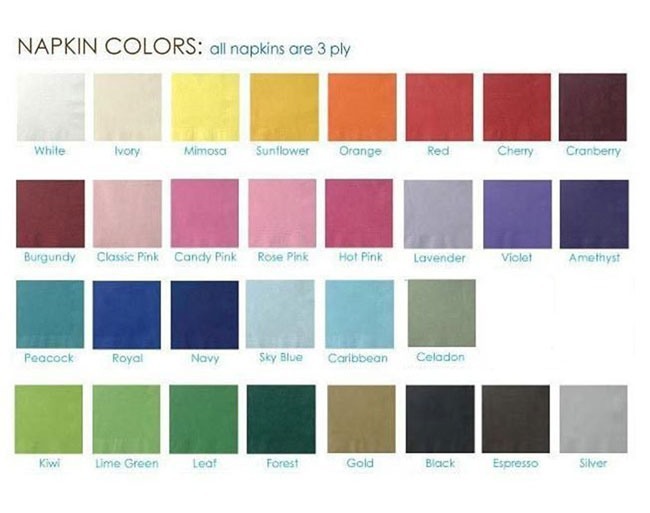 To provide you with the most complete selection of colors, napkin sizes may vary up to 0.5", depending on the color selected.